At that time in my life, and sometimes even now, my predominate “love language” was through “acts of service.” I gave acts of service and I wanted acts of service. On the other hand, my husband’s love language was “quality time.” This seemed so foreign to me, so immeasurable. I “saw/felt/received” love through a checklist, he “saw/felt/received” love through time with me. I thought that time hanging out was a waste of time which translated to him, she doesn’t love me. I’m sure you can imagine the disconnect this can cause in a marriage over time. Before today I never thought of Jesus in these “love language” terms. Yes, Jesus wants our “gifts” our “acts of service” our “words of praise,” but more than anything He wants “quality time” with us. How can I know that? Because there’s a vulnerability in quality time that isn’t in either of the other languages–it’s relational. It requires a slowing down, sitting down, speaking then listening–translation: relationship. For those of us who like to remain busy, it’s hard. In fact it’s downright uncomfortable. Remember the woman at the well? 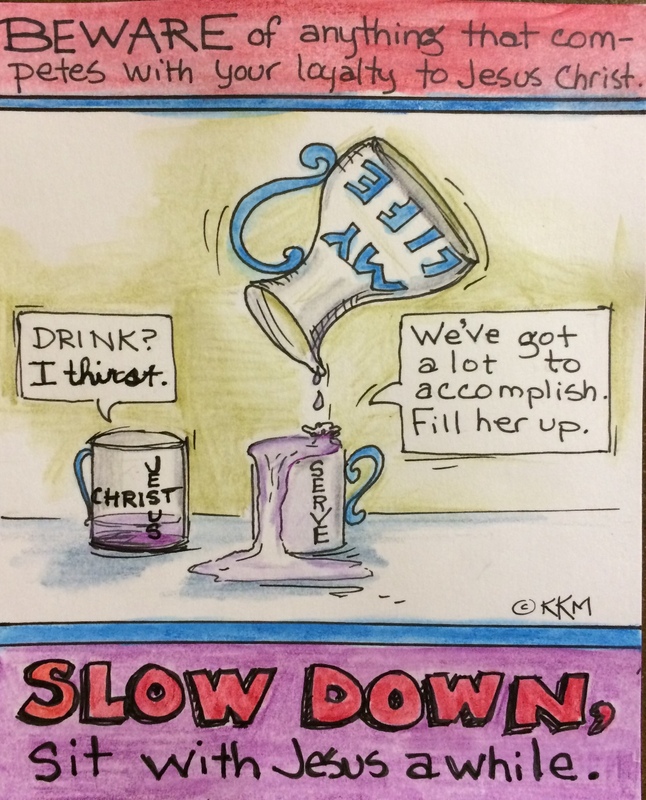 Jesus said, “Give me a drink.” For someone like me, I interpret that as “start working.” But if you think about it, it was an ice-breaker. A way to begin a conversation. An invitation to sit down a while and get to know each other. The ultimate pick-up line. Before their conversation was over He was offering her living water that only He could give. A relationship takes two and we both benefit….Jesus gets an opportunity to sit with us and converse with us, and we are given living water in return. Our “love cup” (pitcher) gets filled and we’re ready to be poured out and share what we received with others around us, just like the woman at the well did when she went and told the whole city about the man she’d just been sitting with. I think you not only have a gift for artistic expression but for writing. I enjoyed this piece like so many others but your written message really caught my attention this time. Thank you Karey, you are so kind. I pray for words that will be meaningful. Praise God for His help.